Mix concrete, mortar, thinset, grout, paint, and other viscous materials with these air-powered (pneumatic) handheld mixers. 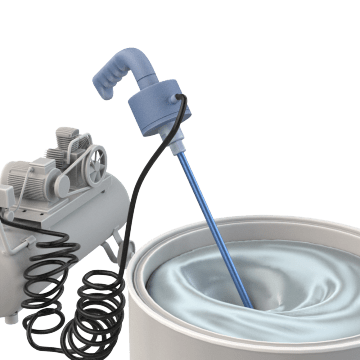 The mixing speed can be continuously adjusted in small increments to provide more control during the mixing process and to adapt the tool for a wide variety of mixing applications. A quick-release shaft connection allows fast removal of the paddle attachment for changing and cleaning. Air-powered mixers are powered by air-compressors and don't have motors to spark or overheat, making them safer for use in environments where flammable liquids and vapors are present.